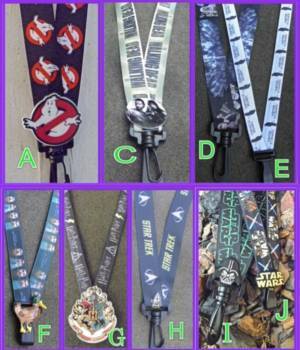 These lanyards are sure to dress up any outfit. They are plastic and easily adjustable as well as being completely washable. All designs had a break-away safety clasp! This lanyard is made all plastic, nonporous silver chain links that are 1 inch wide. It features a Swivel snap hook, is 19 inches long and has a large pink diamond gem embellishment. This lanyard is made all plastic, nonporous silver chain links that are 1 inch wide. It features a Swivel snap hook, is 19 inches long and has a large blue diamond gem embellishment. This lanyard is made all plastic, nonporous silver chain links that are 1 inch wide. 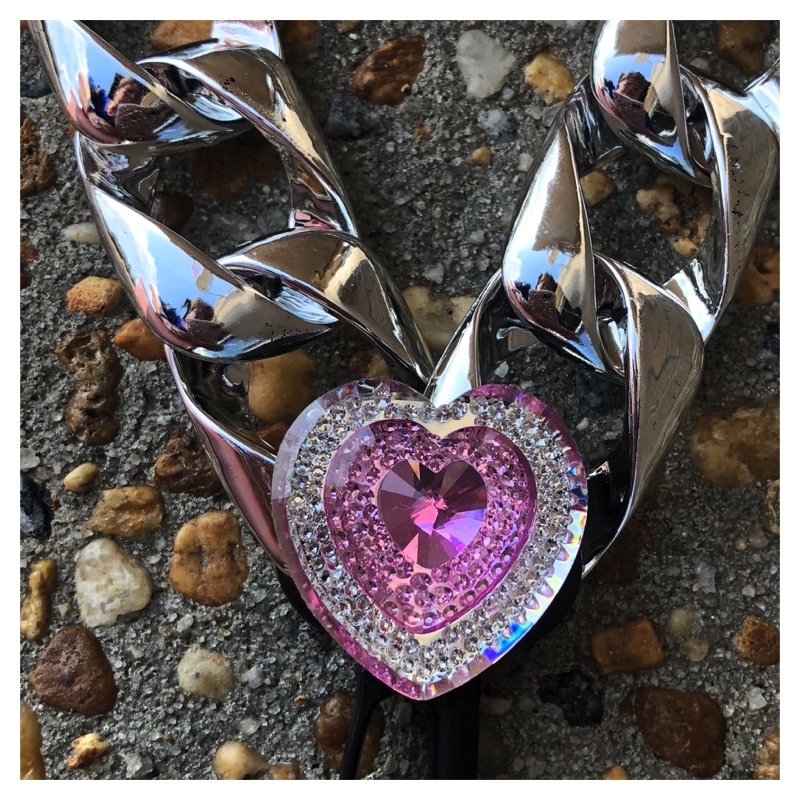 It features a Swivel snap hook, is 19 inches long and has a large pink heart gem embellishment. This lanyard is made all plastic, nonporous silver chain links that are 5/8 inch wide. It features a Swivel snap hook, is 16 inches long and has a white resin flower embellishment. This lanyard is made all plastic, nonporous gunmetal colored chain links that are 5/8 inch wide. It features a Swivel snap hook, is 18 inches long and has a bow gem embellishment. This lanyard is made all plastic, nonporous black shinny chain links that are 1 inch wide. It features a Swivel snap hook, is 19 inches long and has a black and silver flower embellishment. 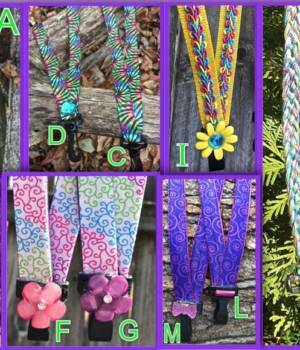 This lanyard is made all plastic, nonporous melon chain links that are 5/8 inch wide. 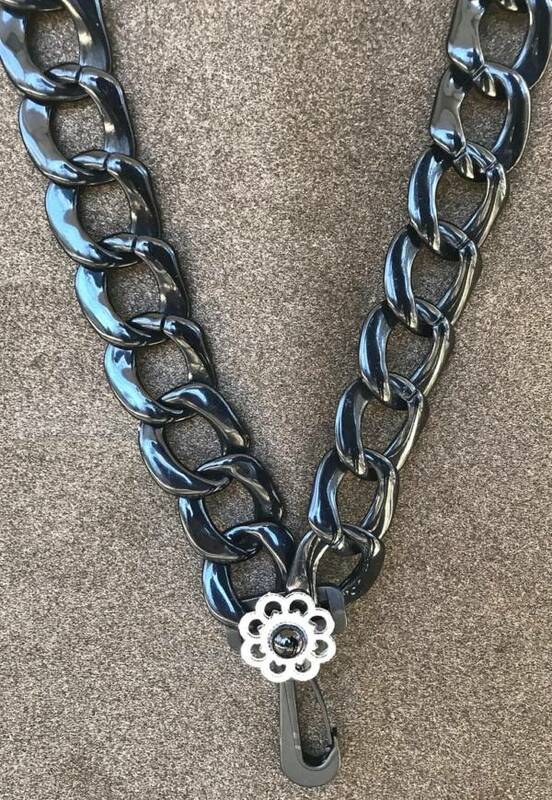 It features a Swivel snap hook, is 18 inches long and has a black 3D resin flower embellishment. 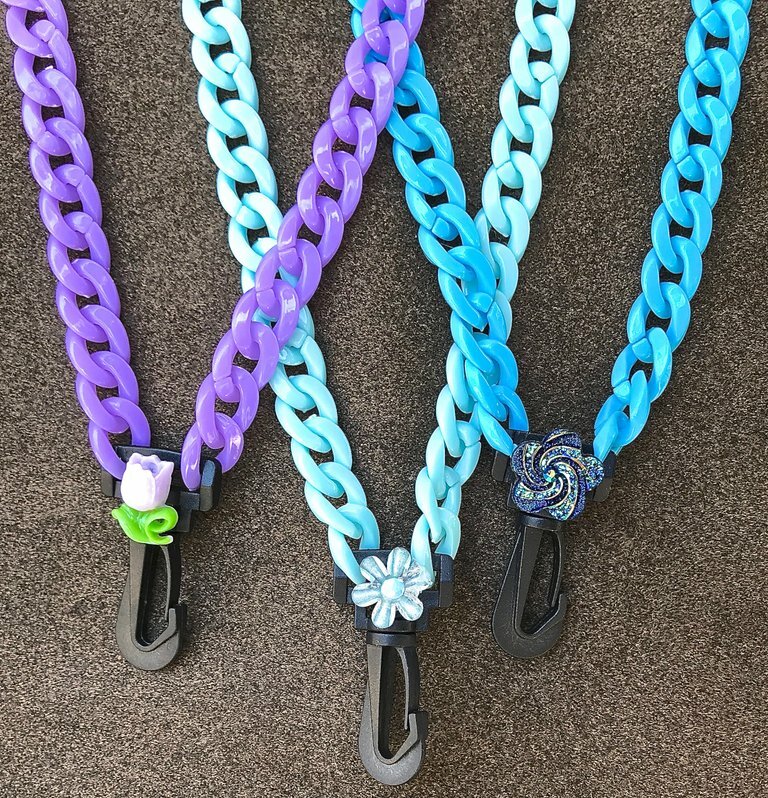 This lanyard is made all plastic, nonporous melon chain links that are 5/8 inch wide. It features a Swivel snap hook, is 18 inches long and has a melon wooden flower embellishment. 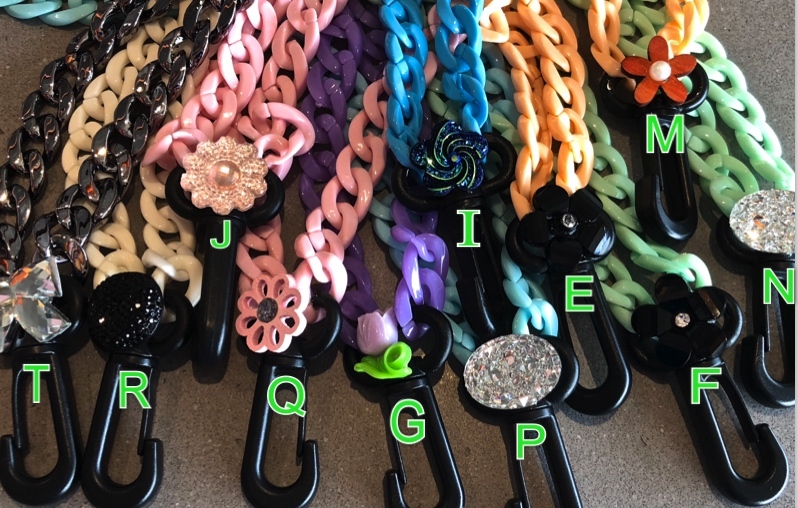 This lanyard is made all plastic, nonporous mint chain links that are 5/8 inch wide. It features a Swivel snap hook, is 18 inches long and has a black 3D resin flower embellishment. This lanyard is made all plastic, nonporous mint chain links that are 5/8 inch wide. It features a Swivel snap hook, is 18 inches long and has an oval sparkle gem embellishment. 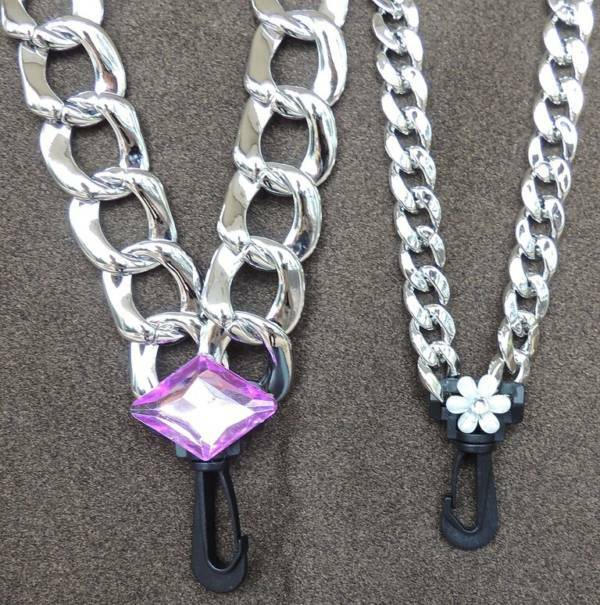 This lanyard is made all plastic, nonporous light purple chain links that are 5/8 inch wide. It features a Swivel snap hook, is 18 inches long and has a light purple tulip 3D resin embellishment. This lanyard is made all plastic, nonporous light blue chain links that are 5/8 inch wide. 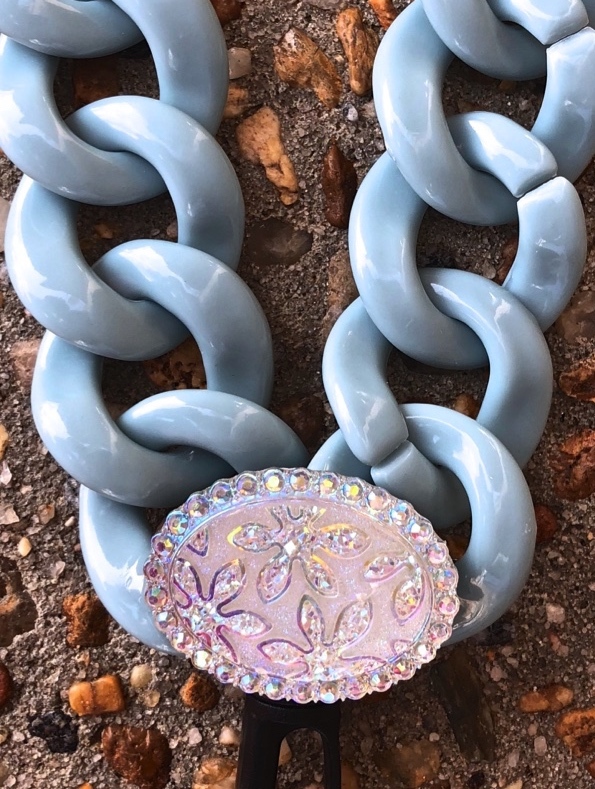 It features a Swivel snap hook, is 18 inches long and has a light blue resin flower embellishment. This lanyard is made all plastic, nonporous light blue chain links that are 5/8 inch wide. It features a Swivel snap hook, is 18 inches long and has an oval sparkle gem embellishment. This lanyard is made all plastic, nonporous silver chain links that are 5/8 inch wide. It features a Swivel snap hook, is 18 inches long and has a blue sparkle flower embellishment. 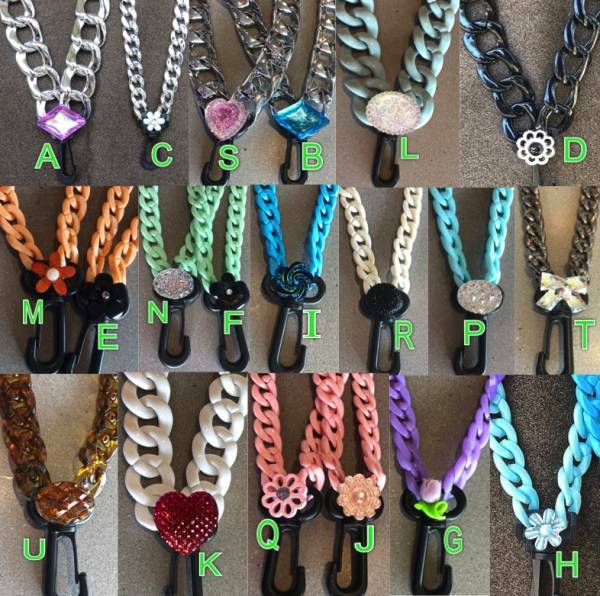 This lanyard is made all plastic, nonporous pink chain links that are 5/8 inch wide. It features a Swivel snap hook, is 18 inches long and has a pink flower gem embellishment. 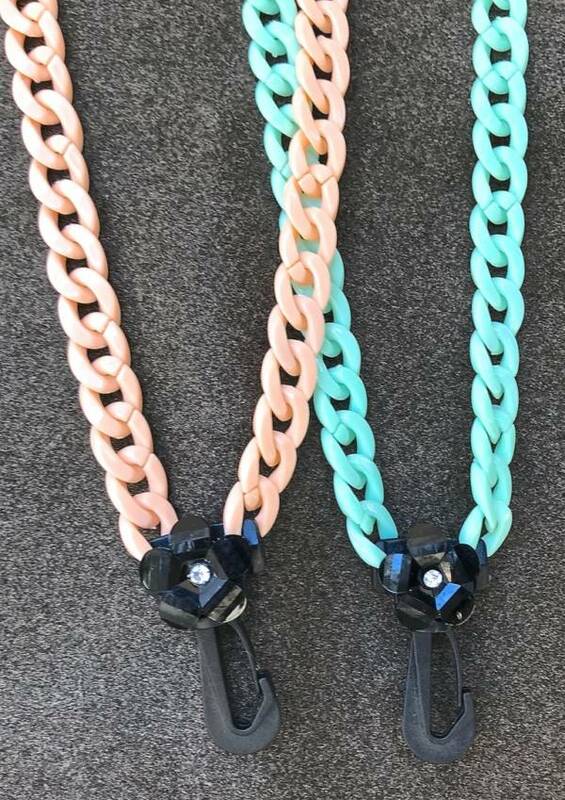 This lanyard is made all plastic, nonporous pink chain links that are 5/8 inch wide. It features a Swivel snap hook, is 18 inches long and has a pink wooden flower embellishment. This lanyard is made all plastic, nonporous cream colored chain links that are 5/8 inch wide. It features a Swivel snap hook, is 18 inches long and has a black sparkle embellishment. This lanyard is made all plastic, nonporous white chain links that are 3/4 inch wide. It features a Swivel snap hook, is 18 inches long and has a red heart gem embellishment. This lanyard is made all plastic, nonporous blue-gray chain links that are 1 inch wide. It features a Swivel snap hook, is 18 inches long and has a oval sparkle embellishment. This lanyard is made all plastic, nonporous tortoise shell brown chain links that are 5/8 inch wide. It features a Swivel snap hook, is 18 inches long and has a tortoise shell oval gem embellishment. 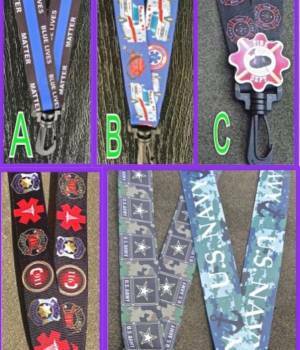 * Lanyard length is listed in the specific lanyard description is measured from break away clasp to end of the snap hook. Length is easily adjustable by lining up the opening of adjacent links and pulling apart.